Bestias de la Reina de la Casa de la Moneda Real | Moneda de oro Halcón de los Plantagenets 2019 de 1 onza Order your 1 oz 2019 Royal Mint Queen’s Beasts Falcon of the Plantagenets gold coin from our online store today for the web’s lowest price. This dazzling coin marks the fourth edition in the royal Mint’s wildly successful Queen’s Beasts series, featuring the ten heraldic beasts present, in statue form, at Elizabeth Ii’s 1953 inauguration. The reverse feature, designed by Jody Clark, is a majestic Falcon, clutching a shield in its talons; the shield bears a smaller but equally detailed falcon, this time perched upon an open fetterlock. The feature is brought into crisp relief by a micro-engraved, textured field and encapsulated by a frame bearing details of title, release year, weight, purity and metal content. The obverse feature is a startlingly realistic portrait of Elizabeth II, set against a light refracting, micro engraved field. Also on the obverse, Elizabeth II regal title, as well as the coin’s unique denominational value. While the falcon was a symbol first used by Edward III and passed down to Edward IV, the fetterlock is particular to Edward IV and represents his struggle to obtain the throne. 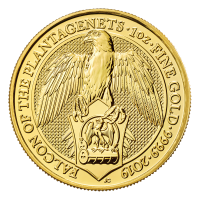 Celebrate Great British heritage and fortify your holdings with a 1 oz 2019 Royal Mint Queen’s Beasts Falcon of Plantagenets gold coin today.